and how you want to be seen"
Do you often feel your look is boring or frumpy? Would you like to always put together outfits that make you feel good about yourself and help achieve your goals? Style is often the missing part of the appearance "puzzle" -- the secret ingredient to looking great. You may find that even after you've learnt how to dress to suit your body shape and your coloring you still don't feel good about the outfits you put together. There's a certain, "I don't know what", indefinable style quality missing, but you don't know how to go about finding what that is. Some would have you believe that style is either something you were born with or not. Actually, that's simply not true, thank goodness! It can, in fact, be learnt. 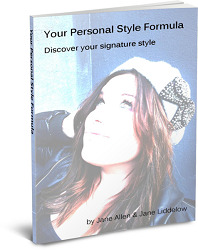 Jane Allen, and I (Jane Liddelow), have written the ebook, "Your Personal Style Formula", especially to help you understand style and discover how to develop your own individual style. This ebook is targeted at one specific, important aspect of your appearance, that is: reflecting who you are through your choices of clothing and accessories. It doesn't contain information on finding your best colors, or what to wear to flatter your body shape. See the navigation menu to the left side of this page for more about these and the other "Steps to Savvy Style". As style and image consultants we are regularly asked to help women, just like you, to understand and develop their own unique style. With this ebook we share our knowledge with you. The style formula we reveal is founded on theory, but has also been refined as a result of years of real life experience of working with our clients, so we know it works. The knowledge you gain from our ebook will last you a lifetime and can be applied no matter what the current fashions are, or what stage of life you're at. The aim is to give you the knowledge you need to discover your own style now and also to give you the means to make updates to your style as your lifestyle needs and goals change over the years, so you need never feel frumpy or unstylish again. To help get you started we give you plenty of examples showing photos of real women (not professional models) wearing different outfits. We then describe the main style types represented in the outfits. You'll see how changing one small part of an outfit, your shoes for instance, can completely change the style of an outfit. You don't have to go out and immediately replace all of your clothes. Work within your budget to change small details of an outfit to refine your appearance and express your personality with your style. The main ebook "Your Personal Style Formula" contains 50 pages describing the style personalities, detailing the 3 steps to finding and developing your style formula, all illustrated with photos and descriptions of the styles, together with details of how to use your style formula. Use this fun style quiz to help you find your blended style personality. You'll discover your main style personality and your accent styles. Use this workbook as you go through the main ebook to find and record your personal style formula. Jane A and I give you worked examples, using ourselves, to get you started. Wondering where to find clothes and accessories that match your style formula? We give you ideas for where to shop for each style personality, together with a price range and a lifestyle category (formal business, business casual, smart casual and so on). We've listed the stores by country (Australia, UK, USA). However, most of them now have online stores and some ship worldwide (which we've also identified). A stylist will charge you anywhere from US$70 per hour or more to help you create outfits that might last you for a few seasons before beginning to feel dated. However, you still won't necessarily know to create looks you love for yourself. Fortunately you can get a copy of this handy ebook for only US$27 and you'll learn how to assess and update your style for life, not just the current fashion season. Then return it! If "Your Personal Style Formula" doesn't fully meet your expectations, simply return it within 30 days, for a full refund. If you're not happy then neither am I. All I ask is that you tell me why. Fair enough? "Your Personal Style Formula" is an ebook available in PDF format. That means you can download the file and be reading within minutes. You'll need the Abobe Reader which you probabaly already have on your computer (and is available free if you don't). You'll also need a free copy of the WinZip utility (your computer may already have this on it too), since the ebook and bonus ebooks come bundled in a Zip file. If you don't have these I'll show you where you can get them for free after you've ordered. You're just minutes away from finding out how to discover your own unique personal style. PS Start transforming your look from unstylish to stylish today. Don't forget this ebook comes with a full money back guarantee. You've got nothing to lose and so much to gain!